Going on a vacation nowadays is something everybody wants, especially if they are living in a fast-paced environment. This is because this is the time when they can relax and enjoy life even for just a few days. But working out on a vacation plan can still be stressful, even if you can accomplish most of your tasks right on your mobile device. This is because since most of your options can be acquired online, the information overload makes it more difficult for you to decide on what kind of vacation to actually purchase. What makes it difficult to plan out a vacation is that your ideas are cluttered. Perhaps in order to start a good vacation plan is by gathering and organizing your thoughts. You can do this on your smartphone by using a mobile organizer app. In this app you can enter your travel ideas, like the places you want to visit, the things you want to do, and where you want to stay. From there you can work on a map and finally a good plan to follow for your vacation. One useful app that you may find handy is Evernote. This is a notepad app where you can jot down your vacation plans and bring them out whenever you have already found the time to organize a travel plan. Organizing is not only important when planning your holiday; it also essential when working on your schedule. With a properly arranged schedule, you will not be bothered by work-related stuff while in the midst of enjoying your vacation. 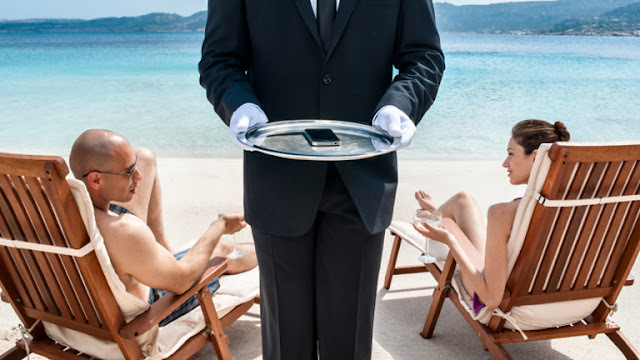 Another way in which you can use your smartphone to get a relaxing holiday is by browsing on it. You can either go online using a search engine, or download certain travel apps in which you can scout for a good vacation spot. There are many apps that you can download to browse for vacation spots, among them include TripAdvisor and Conde Nast apps. These apps work almost the same as their online website counterparts; you can check on vacation establishments and read reviews made by users, as well as go through forums in which various vacation related topics are discussed. You can use these apps to check out activities that you can do in your chosen destination, or the landmarks that you should visit, where you can buy souvenirs, and how to max out your budget during your travel. 3. Book your reservation right on your phone. Once you have made your selections, then you can start making reservations using certain apps that you can download. For booking airline reservations, you can make use of the app called SkyScanner. This app searches for different airlines that service your area, as well as the flights that you can get from them. You can also browse on the airfare rates, schedules and class availabilities using this app. When paying for your reservations, this app will redirect you to a payment processor connected to the airline’s servers, and from there you can complete your travel needs. There are also a lot of apps that cater to hotel reservations, such as the Expedia app. Through these apps you may not only book, change or cancel your reservations. You can also check out other facilities that you want to use in the hotel using these apps. For example, if you are looking for spa resorts in Connecticut, you can browse on the amenities of the hotels listed on the app’s database. This will make it easier for you to choose which hotel to stay in as you know what to expect from it. 4. Use your smartphone as a map. Most vacations are often ruined by one thing-getting lost. It can be difficult to ask for directions as not every local person you meet would be friendly enough to lend you a helping hand. You may also not just be lost for directions, but lost in translation as well. With a GPS app installed on your phone, the better it would be for you to navigate around your vacation destination. You can go for walks without the need of asking for directions, or drive around the countryside with the proper guide. There are different navigation apps that you can use during your vacation. These include Google Maps, which give you a satellite view of the streets and structures in the area you’re in. You can also log on to Foursquare, which gives you a rundown of the nearby local establishments that you may want to check out during your stay. With these apps, you will never get lost. 5. Share your vacation highlights right away! Who says you have to get to a computer just to share the precious moments of your vacation? These days you can immediately share to the world what you’re doing during your holiday, and that’s through social media apps. You can take a picture of yourself or the scenic background you’re in and upload it to Instagram, then share it on Facebook and Twitter. You can also upload multiple photos and create an album that you can post online. With these tools, your friends and followers are able to see what you’re doing almost in real time. The fun of sharing doesn’t stop in social media. You can also use your phone to log onto your blog using special apps. With these apps, you can start writing about your travel, the things you experienced, and your reviews together with photos and videos that you have taken yourself. Going on a vacation is now made more fun and fulfilling thanks to mobile technology. All you need is to get the apps that will help you in processing not only your travel needs, but as well your holiday perks. With them available on your phone, you can definitely relax and enjoy a stress-free vacation right away. Mark Lebuff is a freelance writer who is passionate about vacations, traveling and hoteling. He also writes for Foxwoods Resort; follow them on Twitter and Facebook.